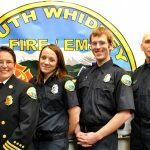 South Whidbey Fire/EMS welcomes volunteers to join our team of Emergency Medical Technicians (EMTs). 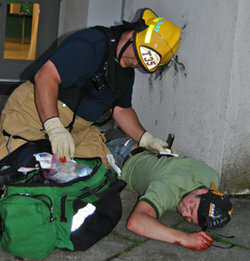 Currently there are approximately 55 highly-trained volunteer EMTs (Emergency Medical Technicians) in our department. Most are also trained as firefighters. We are actively recruiting new volunteers. 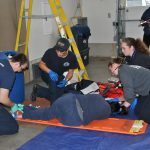 It is challenging to be an EMT, but it is so rewarding that most of our members stay with us for many years. We hope to hear from you. You will go through a training program that takes about 3.5 months. That’s where we’ll prepare you to handle emergency medical situations. Upon successful completion of that coursework, you will be issued a basic first aid kit. As you become more active and start going out on calls, you will be issued a radio and additional equipment and from time to time you will check out a Medical Emergency Response Vehicle (MERV). Click here: For more information on MERV’s. Click to download the Volunteer Application. 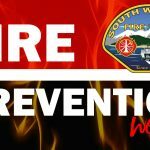 Completed applications can be dropped off in person by the applicant at Station 31, 5535 Cameron Rd, Freeland, WA 98249 during normal department hours so the administration may review the package and give any final instructions. It may also be mailed but this will cause a delay in processing the application. Faxed or E-mailed applications will not be accepted. If you have specific questions please call us directly at (360) 321-1533. 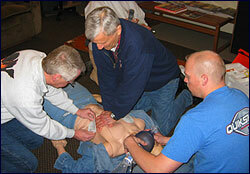 We invite you to observe a drill or to participate as a volunteer patient in one of our upcoming exercises. This will give you an opportunity to begin learning, even before you are officially enrolled in the training program. 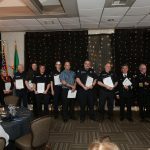 Medical responders complete 150 hours of coursework, plus ride time and patient contact requirements. Classes generally begin each January. However they fill up quickly, so we recommend you apply any time of the year. If there is an overwhelming level of interest, we will consider offering two rounds of courses within one year. The class location alternates each year between the north and south ends of Whidbey Island. What follow-up or ongoing training is required? You are required to pass stringent written and practical skills exams to become certified by the state of Washington. After you receive your certification you will work under the direction and protocols of our Medical Program Director. You will continue attending monthly training and are required to re-certify your credentials with the state every three years. Both men and women volunteer, representing a wide range of ages and backgrounds, from 18 year olds to retirees. You should be fit or willing to get into shape so you can lift 100 lbs., walk a mile and be able to manage and carry basic equipment. Some of the situations you will experience are difficult and mentally taxing. A certain level of maturity is required. This is also extremely rewarding. We encourage you to start the application process. 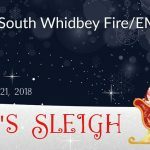 May I be both a volunteer firefighter and volunteer EMT? Yes, and many of our volunteers do both. 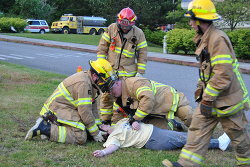 You may wish to begin the firefighter academy first then complete the EMT program during the next coursework opening. The reverse can also be accomplished. is usually the very first responder you see after you have called 911. 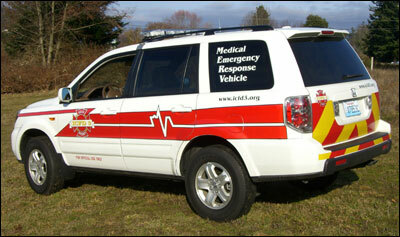 It is equipped with all the gear needed to respond to a medical emergency. Whenever a 911 call is received that may require medical aid…. The MERV is on its way!